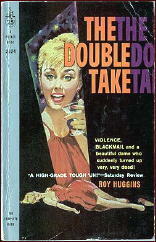 » Archived Review: THE DOUBLE TAKE – Roy Huggins. Archived Review: THE DOUBLE TAKE – Roy Huggins. 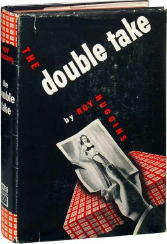 THE DOUBLE TAKE – Roy Huggins. William Morrow & Co., hardcover, 1946. Hardcover reprint: Detective Book Club, 3-in-1 edition, January 1946. Pocket 524, paperback, June 1948; Pocket 2524, 2nd printing, 1959. Basis for the film I Love Trouble, 1947, reviewed here. I say “surprisingly” because I didn’t realize it myself until I just looked it up in Hubin’s book. Huggins wrote two other novels, but neither one has Stu Bailey as a character in it. And yet, because of the TV show, Stu Bailey still might be one of the country’s more famous private eyes. In the case covered by The Double Take, Bailey is hired to find out what secret lies in the past of the wife of a worried husband, a secret so dangerous she could be blackmailed about it. The deeper he digs, however, the more bewildering the trail becomes. She was a stripper at one time, he finds out, and then she may (or may not) have headed off to Brazil. Then when someone who knew her back then dies, then someone who also knew her no longer recognizes her, the trail becomes even more confused. Except to veteran detective story readers, of course, who should be counted on to put two and two together just a little more quickly than Stu Bailey. The end result is a book that is interesting, but one that never becomes enthralling. Huggins soon left the world of book fiction, going into TV almost exclusively, writing, producing and directing. It’s hard to say he made the wrong choice. Speaking for myself, though, I think it would have been nice if there had been a second full-length appearance by the Stu Bailey who appears in this book. Or more! — This review was intended to appear in Mystery*File 35. It was first published in Deadly Pleasures, Vol. 1, No. 3, Fall 1993 (slightly revised). [UPDATE] 10-05-11. If you were to go read the review of the movie I wrote, and you should, of course, you may be amused as much as I was when I said that I thought I’d read the book, but after watching the movie, I decided I hadn’t! Didn’t recognize it at all. And how much of his prose was ghosted? I’m under the impression that Howard Browne ghosted at least some of his attributed fiction. I’m fairly sure that a story that Huggins was supposed to do for FANTASTIC ended up being written by Browne. 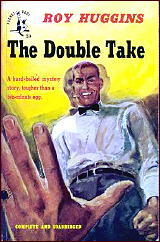 I also remember reading that when Huggins wrote THE DOUBLE TAKE for MAMMOTH MYSTERY, where it first appeared, he had trouble with the ending, and he relied on Browne, who was the editor, to help him finish it. Whether true or not, I don’t know, but it certainly sounds plausible. Is this why John Thomas James (Huggins TV writer credit) nearly always was credited with only the story and the written by credit would go to someone else? I never did understand why Huggins used the name John Thomas James for most of his TV writing, and a quick look for help on the Google didn’t help much. Perhaps he came up with the basic stories and let others do the actual scripts? John Thomas James were the names of his three sons. My guess is so his name would not appear too often on screen. Screen credits have always been half fiction. Today most showrunners write great chunks of scripts but don’t take screen credit. But that is a question I would love to hear Todd take a shot at answering. My understanding is that script writers on Huggins’s shows weren’t always so crazy about Huggins taking story credit as John Thomas James. You can be sure it had to do with money. I would love to hear more from Steve and Todd about the relationship between Huggins and Browne and those ghosting allegations. Any place I can read about that? Howard Browne talks about his relationship with Roy Huggins in a memoir he wrote. I’ll see if I can’t find a title in a moment. The memoir is included in a book of Browne’s short stories, INCREDIBLE INK (Dennis Mcmillan Tuscon 1997). It was online at one time, but it doesn’t seem to be now. You guys are crushing my hero-worship of Huggins. When, in 1976, I was just beginning my path to the heartbreak of the entertainment business, I noticed how many of my favorite TV episodes had a story by John Thomas James credit. He was my favorite “writer”. Certainly he remains one of my favorite TV producers, but him as a great TV writer, well, my beliefs have been smashed. This is, of course, tongue in cheek and totally true. In the eighties I had a crush on one actress, later I met one of the producers and was actually thrilled to hear negative gossip about her. It humanizes them to me. If I remember right Browne wrote for some of Huggins’ series. I need to find that book. Looks like you’d give it an A or an A Minus over my rating of B Plus, Richard, so I’d have to say that our opinions are awfully close.